Medication can be helpful when it comes to treating menopausal symptoms, but what you eat and drink has a large impact on your overall well-being and how you experience menopause. It's difficult, and not very practical, to completely cut out unhealthy foods or foods that trigger menopausal symptoms from your diet. Therefore, it is best to try to reduce your intake of these foods and become aware of how your diet impacts you. It's advisable to limit any processed foods that contain high levels of saturated fats and sugar. This includes white bread, pies, cookies, muffins, and cakes. These foods do not fill you up, can contribute to weight gain, and cause blood sugar levels to spike. In order to avoid these unhealthy foods, try replacing white bread and pasta with their whole wheat versions. These will do a better job of filling you up, and they contain whole grains and fiber, which are good for you. Most people love a good coffee early in the morning or an ice-cold soda in the afternoon. Caffeinated beverages are harmless once in a while and can be a nice indulgence while relaxing at a coffee shop or spending time with friends. However, caffeine can become a problem if it becomes a crutch or something you need to have constant access to. Try to slowly decrease how much caffeine you consume, and replace it with water, 100% fruit juice, or herbal tea. Sodium causes your body to retain fluids, which can make a person feel uncomfortable and bloated. Regularly consuming too much salt can raise blood pressure, which increases a person's risk for having a stroke or getting heart disease. Alcohol can trigger headaches, hot flashes, night sweats, and anxiety. 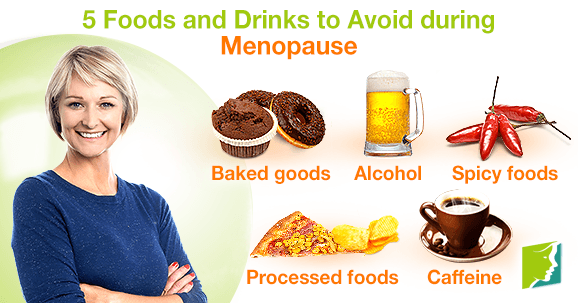 Decreasing how much alcohol you drink and avoiding binge drinking can help reduce menopausal symptoms and while also benefiting your overall health. The compound present in peppers that makes them spicy, capsicum, can trigger hot flashes and night sweats if consumed in the hours leading up to going to bed. However, don't feel like you should completely cut peppers that contain capsicum out of your diet, since this compound can help relieve osteoarthritis, psoriasis, and shingles. It's a good idea to keep a journal where you can keep track of the foods that you eat and any menopausal symptoms or health problems that you have. This way, you will be able to tease out any connection between your symptoms and diet. If your menopausal symptoms are altering your quality life, it is important to see a doctor. This way, you can receive prescription medication and advice that is tailored to your situation and symptoms.